Not only have all Tracfone phone prices been lowered it appears that the shipping charges have been eliminated also. For the last several months there has been a free shipping program for any purchase over $19.99. There has been a $3 discount code available now for quite a while Check it whenever you purchase a phone. Tracfone has the LG 225 on special. This camera phone (the only folding camera Tracfone) comes with DMFL (double minutes for life) and for Mothers Day Tracfone is throwing in the Accessory Kit. This makes the LG 225 the best Tracfone deal at this time. The accessory kit is normally $30. If you phone does not have DMFL buy the LG 225 and save money on minutes. This phone is on sale for the same price as the DMFL card sells for only at the Tracfone.com Website . Not to be outdone by Tracfone, Net10 Prepaid Cell Phones has a Mothers Day Special on the Motorola W375 with free accessory kit. This phone is normally $79.95 and the accessory kit is normally $30. This is the top of the line Net10 folding phone with a camera. This phone also comes with 300 minutes and 60 days of service. The Net10 deal is a little better deal than the Tracfone because of the free minutes included with the Net 10 Phone. .
Tracfone Minutes for 8.8 cents a minute without using Bonus codes. If you have the Double Minutes for Life (DMFL) card on your Tracfone you can purchase (only from the TracFone website) 900 minutes for $80. LG3280 Now with DMFL for $50. Now CDMA (people living where AT&T and T-Mobile do not work) Tracfone users can get the LG3280 with DMFl. Don't buy the DMFL card Buy a New TracFone LG 3280 or W370 for $50 with DMFL on it for the same price. 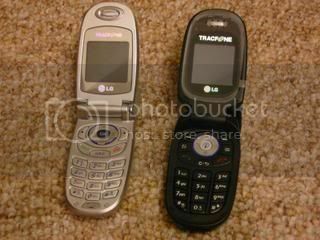 Tracfone Lg 3280 and the LG cg225 Camera Phone. Just announced through the website the Motorola W370 price has been reduced and the phone now includes double minutes. The phone formerly sold for as high as $79.95 is now selling for $50. The Double Minutes for Life (DMFL) card normally sells for $50 also. This has become one of the best value Tracfones now. If you buy the basic Motorola and put the Doubler Card on it you will spend $70. What is the point of that? Go to the Website and buy the W370 and also buy one of the twofer deals. Buy a Moto C139 and get two 60 minute cards. Now activate your Moto W370 phone online and you will get 20 minutes. Check out my latest bonus codes at Tracfone Bonus Codes. You will find bonus codes for the 60 minute cards that will add 60 minutes plus with the doubler you will get 60 minutes. 180 minutes on each of the 60 minute cards you got with the C139. Most bonus codes will work only once on your phone. Sometimes after six months you will be able to use a bonus code again. Buy a Motorola W370 phone for $49.99 and get double minutes for life! More Tracfone News--Thats right the Two 60 minute cards for $19.95 plus a free phone is now back in action both for GSM area where you will get a Motorola C139 and for the first time in a long time it is available in CDMA area where you will get a free Kyocera K126c. 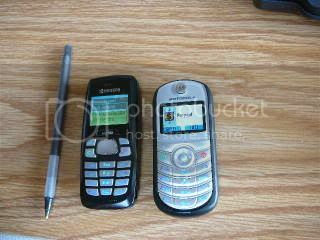 Tracfone Kyocera K126c on the left and Tracfone Motorola C139 on the right. Two 60 minute cards and a free phone is a great deal for $19.95. The website will only let you buy two of these deals at a time. If you do not activate these phones they will not let you buy phones again from them for a while. If you are buying the Two'fer phones just to get the minutes be sure to activate the phone so you can buy more phones from the website. One night I was able to buy two phones and then two phones and then two phone and then two phones. My credit card company stopped me from ordering more. If you try to order your second pair of phones the next day Tracfone will not sell them to you. Tracfone News Link to the Tracfone.com Web Site.